Coquihalla Campground is centrally located in Hope, BC. 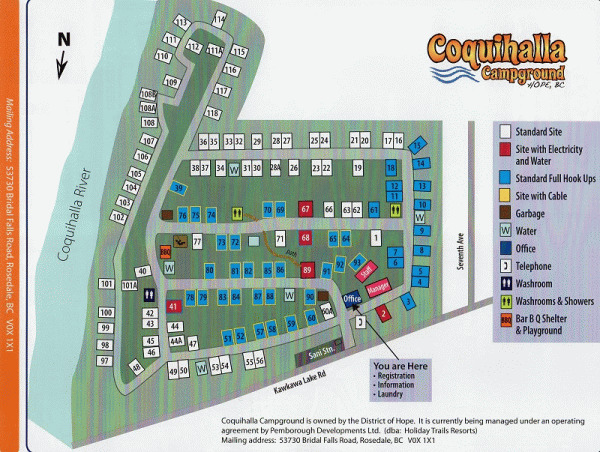 Coquihalla Campground has 123 campsites. Walking distance to recreation complex. Walking distance to tournament sports fields. Home to the historic Othello Tunnels - built between 1911  1916 to complete the Kettle Valley Railway line. Charming downtown and art gallery. Unique Chainsaw carvings exhibits throughout the community Hope slide. Hope golf course along the bank of the Coquihalla River. Fraser River for world famous Salmon and Sturgeon fishing. Spring salmon (Chinook) runs from May through December, Sockeye runs in the summer, Pink salmon runs in the fall and some Steelhead in the winter. Skagit River is often referred to as the best dry fly stream. Silver Creek is considered a Steelhead and Rainbow heaven. Kawkawa Lake for Kokanee, plus some Cutthroat. Lake of the Woods annually stocks Rainbow trout. Jones (Wahleach) Lake is a popular stocked fishing lake. Silver Lake has a catch and release policy. Please visit Coquihalla Campground Website.